I have been building model kits for many years. I started off making WWI planes, but quickly switched to building tanks and soldier kits. I built most of my kits back in the 90's when I was a teenager in high school. I won five IPMS awards for my work in 1996 and three more in 1997. Personally, I don't consider my work to be great, just adequate. It's good enough that I'm happy with it, but I know there are some truly awesome modelers out there that do much better work. Nowadays, I mostly build kits for my father who is no longer able to build models due to Parkinson's disease. 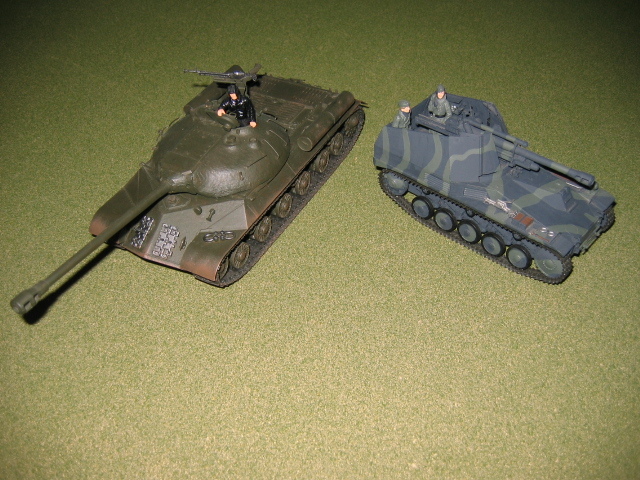 Not my best work, but two of my favorite Tamiya kits: Russian JS3 and German Wespe. Both kits were first assembled and then hand painted with Tamiya Acrylics.